Another plain, simple, easy white dress shirt. With a straight collar to make it even easier. A solid black sport coat to ease the conglomerating even more. Work has been busy so my mind has been elsewhere? Maybe? The necktie is another Ferrell Reed City of London. When I find something I like, I stick with it. Maybe a little too much, too rutted, too safe. 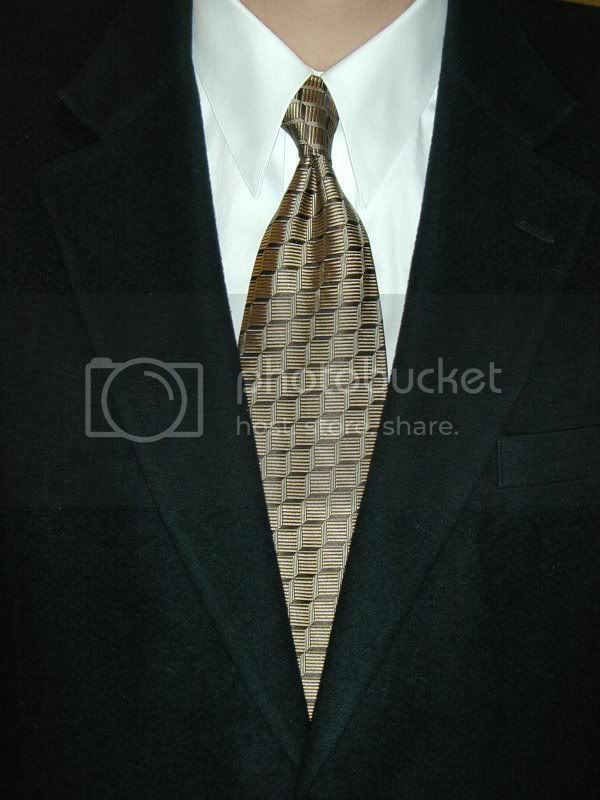 The tie has a gold background with black accents. The geometry may look like curved lines but I assure you, they are all quite straight. Except where the dimple curves the fabric. Up close the boxes look three dimensional. This is another somewhat Escher type pattern, somewhat optically delusional. I keep checking your blog... hope you have been on vacation, haven't run out of steam (and jackets and ties). I ran out of blogging time. :( I had a small plumbing problem to fix up at home and I got a brand new job. Coats and ties don't mix well with plumbing and I'm hoping that coats and ties do mix well with the new job. I was planning on doing a catch up blog for the last three weeks. I've still got a lot of ties to get through. Vacation starts tomorrow! I will be away for a week. Thanks for noticing that I was gone! :) I have been checking your blog too but hadn't had time to post a reply -- I did set up an account so that I can comment.